What’s the big deal about snoring? Home » What’s the big deal about snoring? Most of us have poked fun about a family member or friend who snores loudly. It is of course no laughing member when it is your spouse you sleep with every night as it can cause severe sleep disturbance, especially if you are a light sleeper. Thankfully, most Asian wives (yes guys, you snore more than your wives!) are quite tolerant of their husbands or divorce rates would have been much higher! Some of course have to resort to sleeping in different rooms! A lot of people are aware that beyond sleep disturbance, snoring is associated with a medical condition called obstructive sleep apnoea (OSA) where the airway is obstructed when sleeping and the sufferer actually stops breathing (apnoea) for significant periods of time. The oxygen deprivation and poor quality sleep causes patients to feel very tired in the morning even after a good night’s sleep. They feel very sleepy during the day which can severely affect their performance at work or in school. In extreme cases, one can even fall asleep while driving resulting in accidents. Increasingly, OSA has also been shown to significantly impact our health. In the long run, if left untreated, the risk of high blood pressure is increased by 50%. The strain on the heart increases the risk of heart attack by 30% and the risk of heart failure by 25%. There is even an increased risk of stroke by 60%! 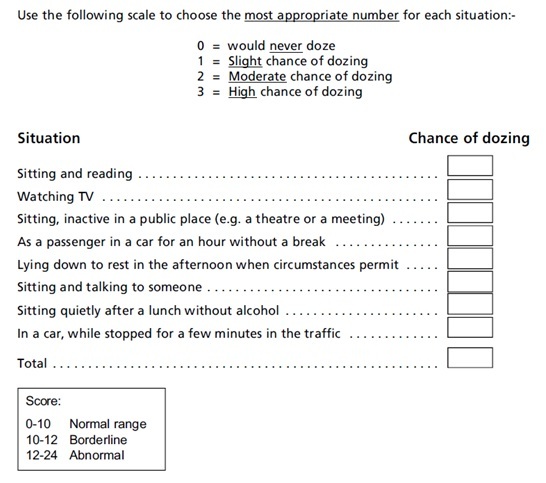 The Epworth sleepiness scale is a common tool used by doctors to see if you are at risk of OSA. Other symptoms in the day include headaches in the morning, anxiety, irritability, poor job performance, memory loss, poor concentration and even sexual dysfunction. In the night, patients have a restless and disturbed sleep and are often observed by their spouse to be gasping or to have stopped breathing. Some wake up frequently at night, sweating or needing to go to the toilet. Men are at increased risk especially with increasing age with weight gain and decreased muscle tone. A neck collar size of 17 inches or more has been shown to be a significant predictor of OSA. Patients with suspected OSA are usually referred to the ENT surgeon for a more thorough examination. The ENT surgeon will look for possible causes of obstruction. Having large tonsils, a low lying palate, fat uvula (the thing hanging down from the palate) and big tongue are some of the common causes of obstruction. Examination is usually completed by an endoscopic examination, passing a tube in through the nose to look at the entire airway for both structural and functional obstruction. The gold standard to diagnose OSA is with a sleep study where various probes are attached to the patient to monitor multiple parameters while sleeping overnight. We look at brainwaves to examine the sleep pattern, measure the oxygen level, airflow and breathing pattern. From these, we assess the degree of obstruction, arriving at an apnoea/hypopnoea index (AHI) – cessation or significant reduction of breathing. Normal individuals are allowed to have less than 5 episodes per hour (AHI < 5). AHI of 5 – 15 is mild, 16 – 30 is moderate and > 30 is severe. If the problem is moderate or severe, it should not be ignored. We always start with non-surgical treatment to achieve the best outcomes. Obesity is the most powerful risk factor for OSA. It is also essentially the only reversible risk factor and weight loss is the only intervention strategy proven to work. I once had a patient seeking a second opinion about major surgery for very severe OSA with an AHI of over 80. He was very determined to work on weight loss and actually managed to lose 20kg over a 6 month period. He came back feeling great and the repeat sleep study was normal! In contrast, a lot of patients who undergo major surgery have a recurrence of their OSA 6 months down the road after regaining weight lost after surgery! Ultimately, diet and exercise remain the most effective means to weight loss. I often stress to patients that where diet is concerned, it is the net calorie intake that is most important and that fad diets simply do not work. It is usually simple mathematics – intake minus output. Hence, if you want to eat more, exercise more to burn off some of the extra calories! Personally, I have found apps like My Fitness Pal on the Iphone a very useful tool to monitor intake and output. While I admit it is stressful to be constantly keeping tabs, monitoring for a period will quickly show where all the extra calories are coming from. Patients who say they live on fresh air and water and still put on weight are lying to themselves! When you undergo a procedure like stomach banding, you truly live on fresh air and water and lose weight tremendously! I used to swear I can’t take unsweetened coffee. I quickly learned to acquire a taste for unsweetened coffee when I realized how many empty calories I was consuming with each cup! A roll of popiah, which is quite filling, is only 120 calories but a small kueh paiti is 88 calories because the shell is deep fried and most of us can easily down 5 of those without feeling full! Similarly, a bowl of delicious dry mee pok with minced pork is over 500 calories because of all the oil whereas a similar bowl in soup is only about 200 calories! To lose about 0.5kg a week (sustainable weight lose without rebound), I could only afford 1500 net calorie intake per day. This was easily exceeded if I was not careful about what I ate. Since I still love to occasionally indulge, regular exercise helped to burn off the extras! Since I believe in practicing what I preach and to show my patients it is possible (naturally without surgery), I have lost about 20kg 3 to 4 years ago and have maintained that ever since! Weight loss is however a long gradual process and we still need to manage health risks in the meantime. 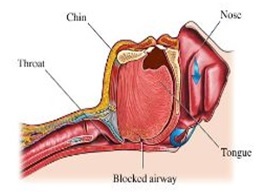 To reduce risks, we usually recommend Continuous Positive Airway Pressure (CPAP) therapy. This is basically a machine which helps push air into the patient, preventing airway collapse. Sleeping strapped to a machine via a face mask seems an awful prospect to a lot of patients. It is however more effective in controlling OSA than surgery if patients are compliant with therapy. It helps prevent health risks while patients work on weight loss and there is some evidence that it helps with weight loss as patients feel more energetic on CPAP. Even if patients eventually go for surgery, prior therapy with CPAP makes surgery safer, reducing risks with anaesthesia. I therefore highly recommend CPAP first and some may avoid surgery altogether if they find CPAP quite tolerable. Finally, there is always a role for surgery in a select group of patients. There are thin individuals with OSA because of the structural problems mentioned above. These usually have the best surgical results. Of course, it gets worse when these patients start putting on weight later in life and that is when they usually present to the ENT surgeon. Overweight patients may therefore also benefit from surgery if they have obvious structural problems. I will usually encourage patients down the path of weight loss first before offering surgery to achieve the best results. There are many surgical options available depending on the nature of the obstruction. Removal of large tonsils has been shown to achieve the best results. Sometimes, the neighbouring soft tissues of the uvula, palate and pharynx can also contribute to obstruction, hence the term uvulo-palato-pharyngoplasty with tonsillectomy (UPPPT). This was the first operation designed to deal with OSA and since then, there have been many variations around the same theme, tailored according to the individual anatomy. Sometimes, nasal surgery is jointly offered if nasal obstruction is deemed to also contribute to OSA but is rarely sufficient as the only operation. There are also many operations designed to reduce the tongue base or to move the tongue base forwards, although I suspect for this group of patients, excessive weight is usually the main problem which should be targeted. I met a taxi driver in Adelaide, Australia who was told he had “terminal” OSA. Instead of major tongue base surgery which is common there, he underwent a stomach procedure, lost 50kg and had a new lease of life!